Amboseli Serena is a large lodge with 92 rooms set against the stunning backdrop of Africa's highest mountain. Situated inside Amboseli National Park there is immediate access to fabulous game viewing, top of the list of course are Amboseli's hundreds of elephants! As well as daily game drives, bird walks and village visits are available here and tribal dances are a feature of the evenings at the lodge. For the more adventurous, bush meals, picnics and sundowners on Observation Hill can be arranged. The lodge is built with a traditional African style and uses local and eco-sensitive materials wherever possible. The rooms, all en-suite, have views over the plains of Amboseli. There is a swimming pool and terrace bar, a restaurant and a lounge bar supplied with board games and books. In the evening guests socialise around to fire-pit, swapping stories and enjoying a chilled beer. Open: Amboseli Serena Lodge is open all year. Location: The lodge is within the Amboseli National Park with wonderful views of Mount Kilimanjaro. It is about a 4 hour drive (250kms) from Nairobi. 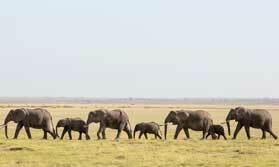 Amboseli airstrip is 11kms from the lodge. Rooms: There are 92 rooms, including 3 triple rooms and 9 sets of interconnecting rooms, useful for families and 1 suite. There is a also a family unit with 2 bedrooms and a shared bathroom. All have telephones and Wi-Fi internet access and en-suite bathrooms with hair dryers, shaver sockets and complimentary toiletries. The Ol Donyo Oibor Suite has a sitting room with TV, video and Wi-Fi, a Jacuzzi and a balcony with views of Mt Kilimanjaro. Room service is offered on request. Activities: Day and night game drives, guided nature treks and guided bird watching walks. Enjoy bush meals and sundowners on Observation Hill with great views of Kilimanjaro. Visits can be arranged to local Maasai communities. At the lodge guests can swim in the pool, relax in the lounge enjoying a book, playing a board game or watching a wildlife video. Facilities: There is an outdoor swimming pool. The lodge has a restaurant and 2 bars, 1 by the camp fire. Beauty treatments and massages are offered to guests. Complimentary tea, coffee and mineral water is available all day. Maasai dances are performed in the barbecue area on some evenings. The lodge has a gift shop. The lodge operates a laundry service and currency exchange. A safe is available at reception. Dining: Meals are taken at individual tables. Special dietary requirments can be accommodated. Children: Children of all ages are welcome. There is a 2-bedroom family room, and there is a babysitting service. Children's and family meals can be arranged. A 4x4 exploration of some of Kenya's top locations, including Amboseli, the Rift Valley Lakes and Masai Mara, staying in comfortable lodges and camps. "Very nice place to stay. The room was very comfortable and cool. The food was of a higher standard than I expected and was very good. The site was very pleasant and I enjoyed watching the wildlife that was present in the camp such as the monkeys and lizards. The service was very good and the staff courteous and friendly."